The C6 Gold Series Large Office In-building Repeater System extends wireless services into buildings and other poor coverage areas. This system is designed for use with 1900 MHz Cellular, PCS GSM systems (Approved for Verizon, Cellular One, Alltel, AT&T etc.) and offers a cost-effective solution for small business applications. 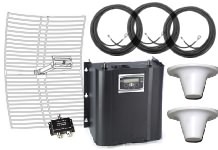 This repeater system comes complete with everything you need to install the system. The system can also accomodate up to 4 inside coverage antennas. Verify your Carrier's frequency here. This system is designed for areas where PCS /; GSM service is available outside of the building yet marginal indoors.This system is a completely network-compatible and recommended device that boosts wireless signals in both the uplink and downlink directions. The system is simple to install, and contains circuitry to ensure proper operating power levels, and as well, includes automatic low isolation and detection circuitry that detects low isolation between the indoor and outdoor antennas. In this condition, the repeater will adjust it's gain to compensate for the abnormality, and warn the user via digital display. This repeater system will also work well with wireless PDAs (Wireless Digital Assistants) and laptop personal computers with wireless PC cards (frequency dependent). Linear operation is guaranteed under all conditions. Be sure to check out our Repeater Tutorial to make sure this is the right system for your application. This is the very same repeater system that major carriers throughout the US have installed for their customers. The only difference is the cost. You could pay tens of thousands more for their identical system. How do we know? Firstly, we have sold these systems to carriers. Secondly, we hear from many of our customers after they have received a quote from the carrier. When they find out they can get the exact same system for much, much less from us, they buy it from us! If you have a quote from your carrier and especially if they provided you an equipment list, please call us to find out just how much money you can save!! 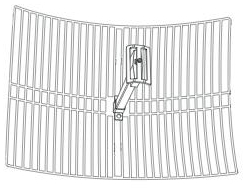 Grid Dimensions: 16" x 20"
This antenna can be used instead of the omni coverage antenna to cover long slender areas. 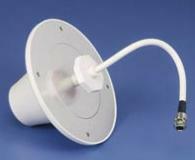 Please see the information here about how to customize your system using these antennas. All of our repeater systems are subject to a restocking charge. Systems are returnable within 30-Days of original purchase. You will need a Return Authorization (RMA) before returning. And of course there are conditions and limitations. To drastically cut back on the need for returns of these systems we offer and STRONGLY encourage as much pre-sales consulation as is necessary for you and/or your associates to completely understand the proper implementation of the system and it's expected capabilities. We will collect vital information from you about your planned purchase and installation in order to be sure you are proceeding in the right direction. There is NO CHARGE for these consultations. Our phone number is even Toll Free! 1(800) 238-2811 In fact, if you order one of these systems via this website and you haven't spoken to us yet, you'll be contacted before we begin to process your order. By doing this we virtually eliminate the need for customers to return these systems. We know that when these repeater systems are pre-planned and correctly installed that they will in most cases exceed expectations. We will NEVER try to sell you a system that has extras you don't need. We will always help you get the system that most closely fits your situation. If you're serious about improving the reception in your situation, we're serious about making it possible! Warranty: Our repeater systems carry a Full One-Year warranty - Certain restrictions apply. Specifications and Pricing subject to change without notice. Please check local regulations regarding installation of external antennas. Installation is the responsibility of the purchaser. Criterion Cellular provides friendly, knowledgeable and free technical support via phone and email for questions regarding installation and application both before and after the sale -- However, Criterion Cellular personnel will not provide support at your location.